Richard Unger presents Lifeprints Hand Analysis at the International Instituate of Hand Analysis: how to make life purpose assessments via the fingerprints! More than 25 years of research were spent developing LifePrints, the creation of Richard Unger, a world's leading authority on Hand Analysis. LifePrints consists of a booklet that specifically addresses your strengths, challenges and life goals. It offers you inspiring information about your best life. 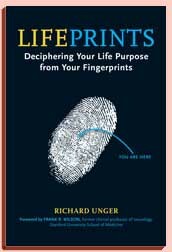 In LifePrints, hand analyst Richard Unger presents a groundbreaking method of self-discovery based on twenty-five years of research and fingerprint statistics for more than fifty thousand hands. Unique, unchanging, and formed five months before birth, fingerprints have been an accepted and infallible means of personal identification for a century. In LIFEPRINTS, Richard Unger presents a groundbreaking method of self-discovery and offers a daily compass for meaning and fulfillment. Combining the science of dermatoglyphics (the study of fingerprints and related line and hand shape designations) with the ancient wisdom of palmistry, the LifePrints system is a simple yet profoundly accurate means of mapping one's life purpose. Like examining an acorn to know what kind of oak tree may one day emerge, reading our fingerprints reveals who we are meant to become. 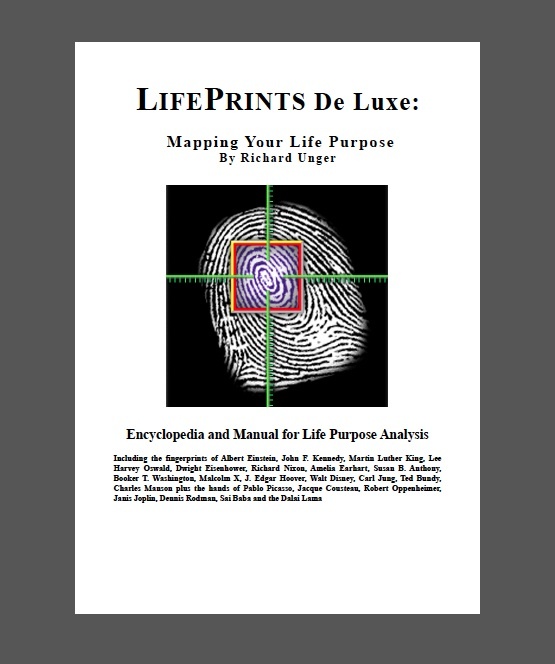 • A guide to discovering one's life purpose by decoding the map revealed in our unique combination of fingerprints. 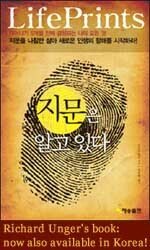 • This new system is based on the author's 25 years of research and fingerprint statistics for more than 52,000 hands. • Features step-by-step instructions for identifying the fingerprints and mapping the life lessons for reaching our full potential. • Includes detailed case studies plus fingerprint readings for Albert Einstein, John F. Kennedy, Amelia Earhart, Walt Disney, Susan B. Anthony, Martin Luther King, Charles Manson, and others. "Here is a 20 page extract from LifePrints Deluxe Appendix II: Fingerprint History and Research freely accessible here with permission from Richard Unger. The + 500 page book that this appendix comes from can be purchased here: LifePrints Deluxe as an electronic download. (It is not available in printed format.)" and now also available Korean language! "Fingerprints are formed five months before birth, don't change and have been regarded as an important means of personal identification for a long period of time. In this book, the author presents a ground-breaking method of self-discovery and offers a daily compass for meaning and fulfillment. Based on the science of dermatoglyphics _ or the study of fingerprints and related line and hand shape designations _ with the ancient wisdom of palmistry, the system is a simple and accurate way of mapping one's life purpose." "The system is based on the author's 25 years of research and fingerprint statistics, covering more than 52,000 hands. The book includes detailed cases of life lessons for reaching our full potential, studies and the fingerprint readings of Albert Einstein, John F. Kennedy, Amelia Earhart, Walt Disney, Susan B. Anthony, Martin Luther King and Charles Manson, among others." RICHARD UNGER is founder and director of the International Institute of Hand Analysis (IIHA). He has lead life-purpose workshops for 25 years across Europe and the United States at such locations as the University of Chicago, Stanford University, the Esalen Institute, and others. He lives in Marin County, California. Find a Hand Analyst in the USA!